TV public service announcement— customize existing TV PSA with your logo. Cost includes editing, review, and finalization, 1 DVD, 1 Beta SP,and one digital file. Upload to stations would be an additional $225, and $75 per station. Media placement/costs are your responsibility. Website Public Service Announcement— one template, customized with your logo. 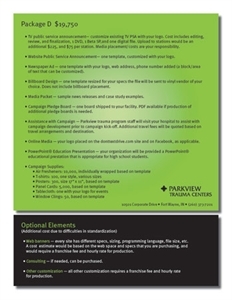 Newspaper Ad — one template with your logo, web address, phone number added (a block/area of text that can be customized). Online Media — your logo placed on the donttextdrive.com site and on Facebook, as applicable.